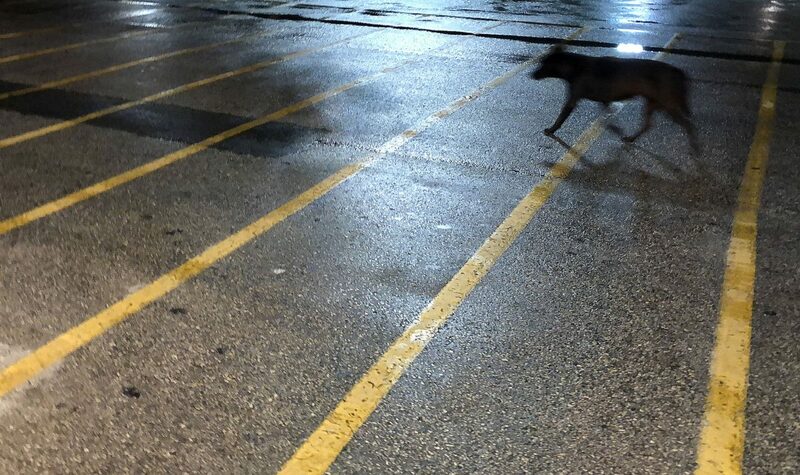 The dog Shadow scurries through the parking lot of an Edinburg H-E-B store on a recent evening. Armed with a tranquilizer gun, the truck continued east and turned left past the pharmacy drive-thru. This is where Edinburg Animal Control pulled in behind an H-E-B last Sunday responding to another call about the elusive black dog who’s evaded them for at least a month. 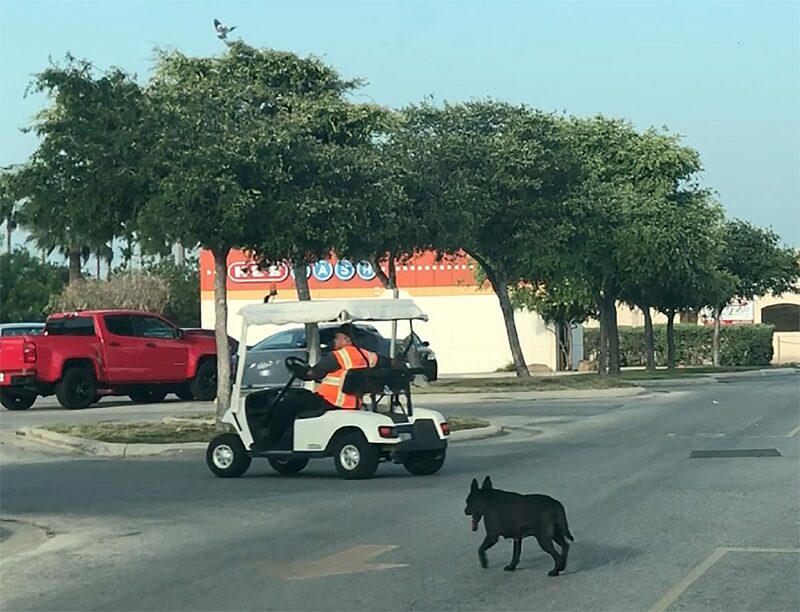 When she’s not fleeing authorities, the black Australian Kelpie mix often patrolled the same route, lining the lot behind a security golf cart like a shadow. She took a liking to a guard and followed his every move, paws prancing across sun-burnt asphalt. As the electric car zigzags aisles, she gave chase, cutting through spaces trying to catch up. If the guard was at the north end of the lot, she would sometimes sit under a tree. If the vehicle was parked at the entrance, she sometimes sought refuge in the shade cast by the building. As the dogcatcher stopped in front of the grocery, employees of the H-E-B on McColl and Freddy Gonzalez approached the truck. The dog would jet when she saw or smelled the truck, according to animal control. 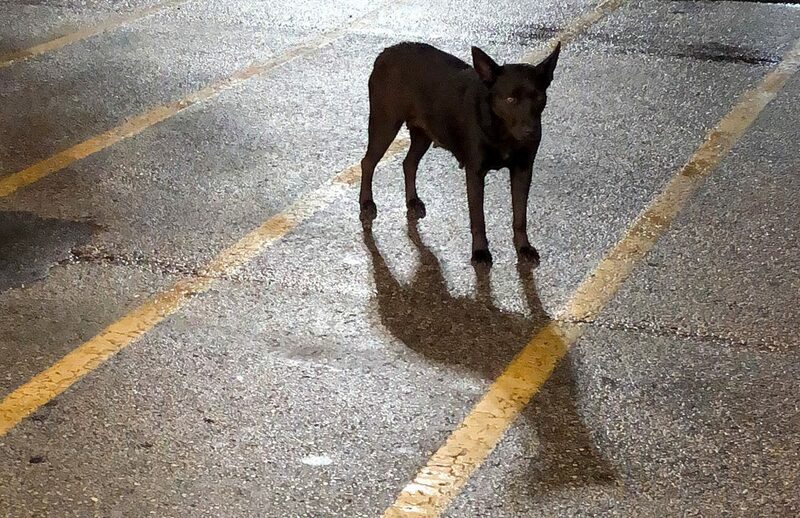 The dog Shadow stands in Edinburg H-E-B parking lot. The dog Shadow follows the store security patrol around the parking lot of an H-E-B store in Edinburg. An arriving customer once walked up to the dogcatcher to voice her concern, saying the dog might as well be shot in the parking lot considering her inevitable fate. And sadly, that pessimism is justified. Palm Valley Animal Center, where she would end up when caught, screens animals for adaptability. They hold strays for 72 hours, but if a dog exhibits aggression toward humans, it’s hard to find a place for them, said Rebeca Villanueva, director of development at PVAC. And while there are no known reports of her acting aggressive, entry into a shelter means intrusive procedures and submission in a style the dog isn’t used to. These assessment metrics don’t bode well for a semi-feral canine like her. Strays might react to people she’s not familiar with while in close quarters. And her black coat makes her statistically less desirable to potential adopters. PVAC recently announced the goal of one day serving as a no-kill shelter with a 90 percent live-release rate. That is a goal distance. Required funding and manpower are unknown to achieve that status, according to a recent Monitor story. But live-release rates have improved from 33.31 percent in 2017 to over 50 percent so far in 2018 — above the year’s goal of 45 percent set by PVAC Executive Director Tim Ousley earlier this year. In 2017, 19,689 dogs and cats were euthanized, died or were lost in care of PVAC, according to the shelter’s stats. As a free-roaming dog, drawing attention to one’s self isn’t how to survive on the lam. The shadow has evaded catchers over several attempts, including nets and a trap usually used to catch coyotes. And animal control acknowledges a tranquilizer dart isn’t optimal at a place of business. An animal takes from 15 to 30 minutes for sedation, and that isn’t something customers or employees might want to see. A feral dog on private property of a business is a liability. And repeated calls haven’t helped. Sunday was no different. It was too early in the day, as security doesn’t arrive until about 5 p.m.
Police considered luring the dog to the back of the store, following the security guard, so the tranquilizer shot would be less traumatic for employees and customers. “We have to analyze everything,” said animal warden Eric Garcia, adding some municipalities don’t use a tranquilizer gun because of the negative association it could evoke. Specific geography surrounding the H-E-B works to the dog’s benefit. Because it’s located at an intersection, animal control knows inadvertently chasing her into traffic wouldn’t be safe for her or the team. And with the lack of fenced lots to corral her, Garcia said, she could have retreated to nearby fields or neighborhoods. “Usually the employees feed them, and that’s why they stick around,” he said. “This one can’t be tamed unless you feed it for a while, and that’s why it follows one of them. But Garcia doesn’t blame H-E-B employees for their compassion, as they were just caring for an animal in need. Villanueva said it’s common for PVAC to get calls from people about picked-up animals that don’t belong to them, but are fixtures of their communities. “People care for these animals,” she said. “They’re just not considered their pet-pet, even though they’re taking care of them. We always encourage folks to get them fixed and put a microchip on them. She added that taking those steps could mean taking responsibility for the animal. And people should check with specific municipalities about regulations on the matter. The vast majority of dogs through PVAC aren’t spayed or neutered. H-E-B declined to participate in this story and did not allow employees to comment. PVAC has offered to provide full services to the dog, if anyone is willing to adopt. They recognize that her best shot at a positive outcome is not ending up at the shelter. Staff writers Naxiely Lopez-Puente, J. Edward Moreno and Rocio Villalobos contributed to this report.